SYNOPSIS: A brilliant, but disturbed, scientist freezes his children alive, while he races to cure their deadly genetic disease by decoding the DNA of the immortal Turritopsis jellyfish. So after reading that synopsis I came in to watching this with a certain expectation about the tone of this film. I knew from the beginning that it was a science fiction/horror, and with that description I expected to watch something that would be both monstrous and terrifying at the same time, especially given my fear of science/medical labs used for dark and nefarious purposes. From the first few minutes of this film I immediately realized that I was in store for something entirely different. 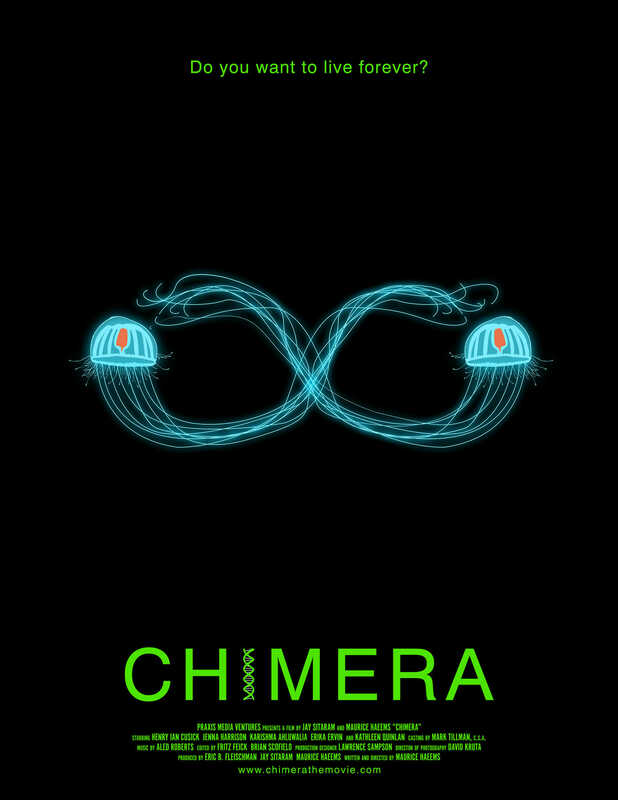 Chimera deals with a scientist named Peter Quint, played by Henry Ian Cusick (Lost; The 100), who is determined to save the lives of his two children, Miles (Raviv E. Haeems) and Flora (Kaavya Jayaram), who are dying of some genetic disease. Part of his research involves studying a unique protein present in a species of jellyfish that can spur unprecedented cellular rejuvenation. However, this is a somewhat unethical area of research that he is pursuing, as we later discover he has left a prominent medical research organization and has struck out on his own. However, time is against him and resources are scarce, so he is forced to go down some dark paths in the hopes of obtaining the materials he requires in order to achieve his goal. This premise could very much sound like the type of film I was originally expecting, but writer/director Maurice Haeems deliberately takes a more thoughtful approach, making this an almost “hard” sci-fi film. In doing so there is a relentless undertone that gives it a feeling that is both disquieting and disturbing, and that is where the horror comes in. It doesn’t play like your typical monster horror movie, rather it shows us the horror of humanity and exposes some of our darker natures and obsessions, as well as highly compromised morality, all in the name of science. In that respect it makes Chimera even doubly disturbing because of its scientifically grounded storyline. Through this film we see the dark lengths some people are willing to go to just to save another person’s life. And yet, for as grounded as this film is, it also has a dreamlike quality to it that reoccurs regularly throughout the film. This could be considered to be something of an unnecessary cheat by some, but that very quality comes in to full play as we see what this dark fixation is actually doing to Quint. Haeems isn’t employing some irrelevant diversionary storytelling tactic with this particular element. It is actually integral to the story, which only heightens that disquieting and disturbing sense that I spoke of earlier. Chimera doesn’t have a big cast, but those who are in it are all quite solid in their parts otherwise this film might very well fall apart. One such character is an individual named Masterson played by Kathleen Quinlan (Apollo 13; Event Horizon) as someone with an equally dark ambition as Quint. He is forced to deal with Masterson in the hopes of acquiring a very desperately needed item(s) in order for his medical experiments to succeed; only she is stringing him along because she needs part of his research to save someone that she cares about. So in addition to Quint having his own problems surrounding his children he now has to deal with Masterson and his continual “dances with the devil.” Quinlan plays Masterson chillingly well. This character could have been portrayed well over the top, but Quinlan makes a point of understanding all of Masterson’s motivations and plays them to perfection. Another character is a colleague of Quint’s and her name is Charlie. Portrayed by Jenna Harrison (My Brother Tom; Servants’ Quarters) we see someone here who is all surprises. Many times when watching a film a character will be presented with his or her own set of principles that help to convey the nature of that individual, and when we see that same character do something in opposition to that it can take the viewer completely out of the film watching experience. Not this time. Harrison’s motivations feel completely believable, even when performing an action that might seem contrary to what we have seen earlier. It was during a second viewing of the film that I saw the very subtle hints that are there to subconsciously communicate the true nature of Charlie, so when an unexpected turn takes place on Charlie’s part, as shocked as our conscious minds might be, subconsciously we accept it because those character breadcrumbs were already laid out for us to follow, which again shows not only the quality of acting on Harrison’s part, but also the quality of the writing and directing from Haeems. Even the children, played by Haeems’ son Raviv and Kaavya Jayaram (the real life daughter of Haeems’ business partner), are consummate professionals in all of the screen time that they have. Then there is Masterson’s, well for lack of a better term, “henchman” named Dita Gruze, and she is played by Erika Ervin (American Horror Story; Hemlock Grove). Her incredible height (at 6’ 8”) does more than make her intimidating. Add a low camera angle and you then have someone who is downright menacing. She doesn’t have much in the way of dialogue, and yet when she is on screen you simply cannot take your eyes off of her, and it’s not just due to her height or how she is filmed. Ervin understands her role and plays Gruze so believably in such a way that you hope to never cross her in a dark alley. However, the real star of this film is Cusick. He has an almost Dr. Frankenstein approach that serves as a callback to the mad scientist as played by Colin Clive in the 1931 horror classic. In both cases we do not have a scientist who is ruled by a thirst for power over others, but instead we have someone who is trying to conquer a scientific absolute in the area of bodily regeneration. Clive’s Frankenstein sought the power of bodily regeneration to beat back death, and Cusick’s Quint seeks to save his children from dying. Cusick is another actor, right alongside Harrison, who knows how to play a very subtle “long game” with his character by giving us someone who we are not entirely sure about. We accept that he believes he’s doing the right thing, that the ends justify the means, but at times I found myself questioning my own judgment while watching and questioning Quint’s behavior, and its those gray areas that are so wonderfully played by Cusick that it leaves the viewer completely unsure as to where Quint, or the rest of the film, is liable to go at any given time. Chimera is a very intelligent film, and unlike some big studio movies that feel the need to thump the viewer over the head with obvious plot points, Haeems assumes that his audience is equally intelligent and will accept this film as it is presented to them. If there is anything negative to say about this film it is the revisiting of this idea that scientists are morally bankrupt individuals. From the earliest days of Mary Shelly’s Frankenstein we have repeatedly seen scientists as unable to operate by any proper moral compass. It’s almost as if we’re still demanding an apology from Shelly for her monster story from years back, and for making scientists the amoral people that they are. Aside from that, Chimera is a magnificent, well thought out film that will leave you feeling rather disturbed, it will make you question some of the pursuits of the scientific community, and lastly will horrify you due to the dark lengths people will commit against others in the name of science. Chimera receives 4.5 out of 5 jellyfish!!! This is a pre-preview of Chimera, as well as a “first look” exclusive preview for the Two Gay Geeks, as this film is not slated to have its World Premiere until the spring at a major film festival, with a release date later in the New Year.